Company not paying vendors while fighting with investor. More than 300 Faraday workers gathered at the plant last weekend to help clean it up. Less than a year after it was rumored to be out of money, budding electric vehicle maker Faraday Future appears to be out of money again — even after getting an $800 million infusion from a Chinese conglomerate. According to a filing with Hong Kong Stock Exchange, the healthcare division of Chinese real estate group Evergrande is accusing Faraday Future founder and CEO Jia Yueting of trying to back out of the deal the two sides made in January. Evergrande officials claim that Jia blew through the $800 million and wanted another $700 million, and say they will take “all necessary actions” to protect itself and its shareholders. Conversely, Jia claims the company agreed to make two payments and after making the first, is trying to get out of the second, a $700 million payment due in 2019. Faraday and Jia, who also founded a tech company named LeEco, which is also having problems, have struggled in the past with finances. In fact, Jia is blacklist in the China and lives in the U.S. now because all of his assets in China have been seized. The EV maker broke ground for a plant in Nevada, then ditched it for an existing facility in Hanford, California. The company’s first vehicle, the FF91 SUV, was supposed to start rolling off assembly lines at the end of this year. 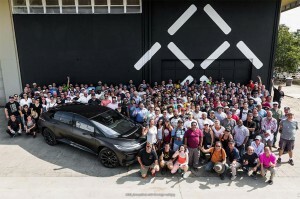 However, in a scene that might be viewed as a microcosm of the company’s existence, the only pre-production of model of the FF91 caught fire in September after an event where it was shown off for the company’s employees, according to The Verge.com. On top of that, some of the company’s vendors are no longer being paid, according to reports. Some are owed as much as $1.5 million for past debts and have filed liens against the company, the website reported. Jia’s inability to effectively manage the company’s finances apparently came to a head last year when he clashed Faraday’s then-CFO. Jia managed foil new investment in the company, and aborted an attempt to restructure the company through bankruptcy, causing the CFO to resign. The deal with Evergrande was not an easy one, coming with some tough terms, such as signing away Faraday Future’s intellectual property as well as some of its assets. The Verge also notes that Evergrande has been establishing research-and-development centers with Faraday Future’s brand in China. It also bought a $2 billion stake in a Chinese chain of auto dealerships in preparation for selling new EVs it reported. The news is a dramatic departure from just six weeks ago when the company was bragging about its progress. The FF91, first introduced to the public and media at the January 2017 Consumer Electronics Show in Las Vegas. During the past two years, the FF91 has undergone intensive validation testing in all possible conditions to be certain that the final product exceeds the expectations of affluent buyers, the company noted at the time. This entry was posted on Monday, October 8th, 2018 at and is filed under Automakers, Automobiles, Business, EVs, Electrified Vehicles, Executives, Faraday Future, Financials, Investors, Luxury Vehicles, Markets, Personalities, Sales, Technology. You can follow any responses to this entry through the RSS 2.0 feed. Both comments and pings are currently closed. I thought Faraday moved to Arizona. Also, this particular article appears to have numerous typos and grammatical errors. Maybe it was written in China?